The Latin American insurance industry shrank by 3.7 percent in 2016 following the depreciation of most of the region’s currencies. Total turnover for the industry reached $145,200 million. 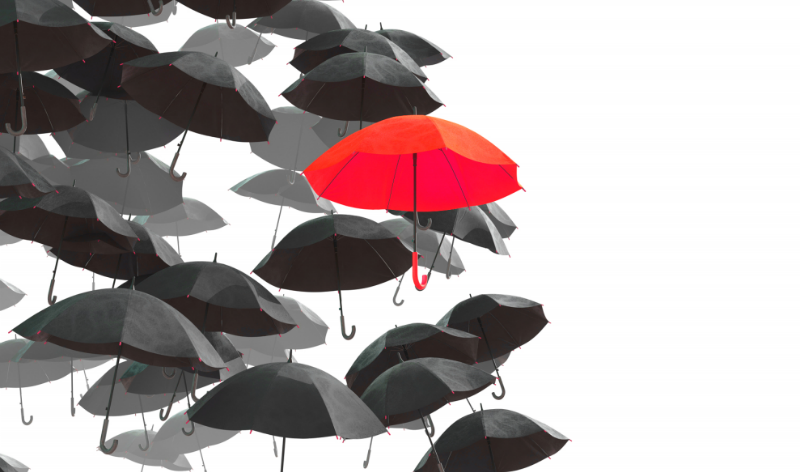 These are the findings of the annual study on the Latin American insurance market conducted MAPFRE Economic Research and published by Fundación MAPFRE. However, the report shows that if the analysis is limited to the 10 main insurance groups in Latin America, which account for 44 percent of the market’s revenues, the comparison with the previous year indicates a 3.3 percent increase in business. This apparent disparity between the shrinkage of the total market and the growth of the main insurance groups reveals a slight increase in concentration, mainly explained by the positive performance of Life insurance in Brazil in 2016 (up by 17.7 percent). 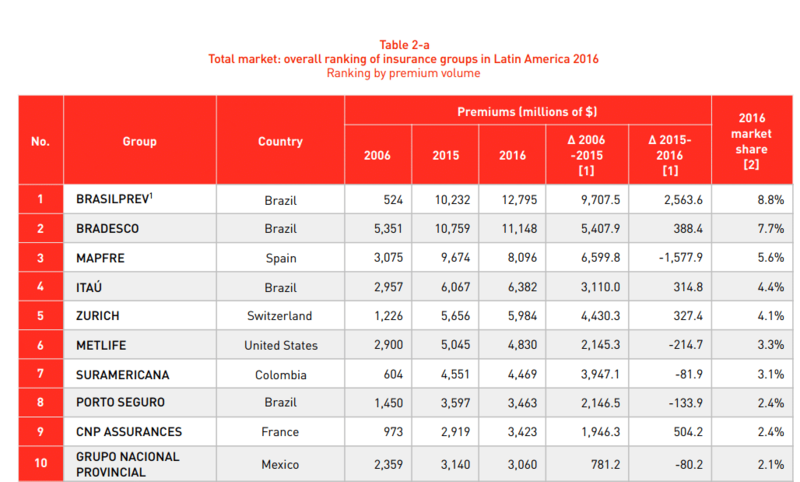 In fact, two Brazilian insurers lead the overall premiums ranking. Brazilian Life insurance has seen robust growth for more a decade following the launch in 2002 of the product Vida Gerador de Beneficios Livres (VGBL), which provides supplementary private protection. Mainly distributed through banking channels, this insurance product achieved a premium volume of more than $30,000 million in 2016, representing 45 percent of total premiums in the Life segment of the Latin American market. The top position is held by Brasilprev, a company owned by Banco de Brasil and Principal Financial Group, which has pushed Bradesco down to the second spot. They are followed by MAPFRE, in the same position since 2015. Meanwhile, the total premium volume for Non-Life business in Latin America was $78,700 million, down 11.3 percent from the previous year. This fall is largely explained by the measurement of the market in dollars and the impact of the depreciation of many of the Latin American currencies in 2016. 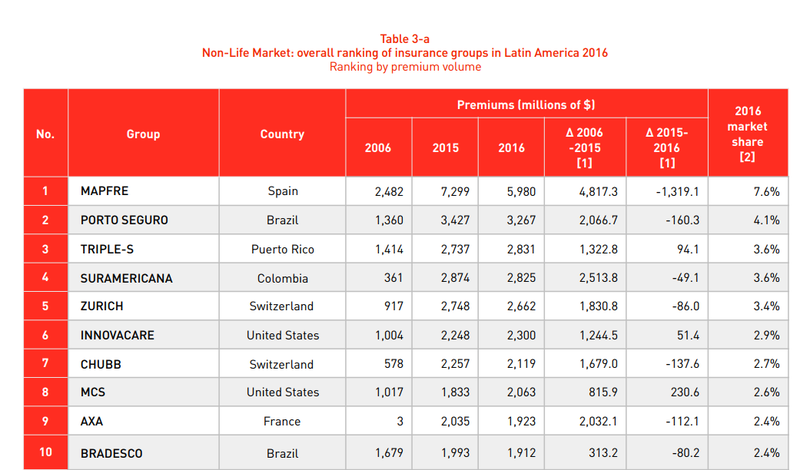 The top 25 insurance groups in the Latin American Non-Life sector accounted for 60 percent of the premiums in 2016. MAPFRE continues to lead the ranking with a market share of 7.6 percent in 2016, practically double that of the group in the second spot (the Brazilian Porto Seguro, with a 4.1 percent share). Lastly, in relation to the Life business, Brazilian groups continue to occupy the top three positions. The size of the market in December 2016 was $66,500 million, up by 7.1 percent on the previous year. The top 25 Life insurance groups in Latin America accounted for 83 percent of the premiums in 2016.